Rangers could be priced out of a permanent move for Ryan Kent - after Liverpool slapped a price tag of up to £10 million on the winger, who has impressed at Ibrox. Steven Gerrard is aware he is fighting a losing battle, according to reports, with the hefty fee also ruling out any chance of a second loan deal for Kent. Rangers target Stewart Downing is understood to prefer a move to Sunderland rather than Glasgow, according to reports. The Ibrox side were linked with a move for the out-of-favour Middlesbrough midfielder, who looks likely to leave the Riverside in the summer. 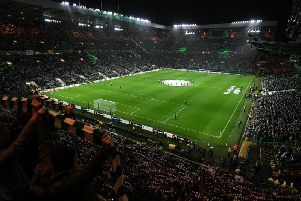 Kieran Tierney hasn’t trained this week despite suggestions the Celtic defender would be fit to face Rangers - even after missing Scotland’s opening two Euro 2020 qualifiers. The Hoops have been boosted by the return of Dedryck Boyata, Olivier Ntcham and Tom Rogic, but the left-back was nowhere to be seen at Lennoxtown on Tuesday. Former Aberdeen defender Jack Grimmer has revealed he has held talks with Scottish clubs as he eyes a return north of the Border. The right-back has fallen out of favour at Coventry and has revealed former team-mate Marc McNulty’s explosive return to Scotland with Hibs has given him food for thought. Former Celtic striker John Hartson claims Rangers’ victory in December’s Old Firm clash was the worst thing that could happen for the Gers - because it ruined their title bid. Hartson said: “Rangers got carried away by that result. If you look at the results since that win at Ibrox, I don’t know if they took their eye off the ball. Hearts are “making progress” with talks over new deals for Steven Naismith, Arnaud Djoum and Peter Haring, according to manager Craig Levein. The Jambos boss said: “I’d like them all to stay so we will keep chipping away and hopefully we can get there.